Our Company | GSK Climate Control, Inc.
Greg started GSK Climate Control in 1985, after attending SUNY Canton & Dehli Colleges for Plumbing, Heating, Refrigeration and Air Conditioning. 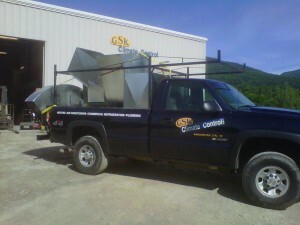 Well-versed in all aspects of the industry, with over 30 years of hands-on experience and successful business, GSK provides quality HVAC/R (heating, ventilation, air-conditioning, & refrigeration), as well as plumbing service & installation in southern and central Vermont and surrounding regions. With a state-of-the-art sheet metal shop, GSK also provides clients with custom full-service sheet metal fabrication. In 2008 he was chosen out of 22,000 to compete in the North American Technician Excellence (NATE) certified technician competition in Atlanta, Georgia in 2009. He holds licenses in electrical, propane and oil, as well as certifications in Solar, EPA, NATE, PEX-piping, and Geothermal. Greg has assembled a team of respected professionals who contribute to the success of GSK Climate Control, Inc.